Have you been injured in a car accident in Massachusetts? The Boston, Massachusetts Law Offices of William D. Kickham & Associates are experienced attorneys in the area of car accidents and the personal injuries that can result from them. Here are some of the actions you should take immediately after a car accident, to safeguard your legal rights. Under Massachusetts law, you must stop at once if your vehicle hits another motor vehicle, including trucks, motorcycles and bicycles, or a pedestrian, an animal, or if your vehicle hits someone else's property. Pull over to the side of the road and park in a safe place away from traffic. Call the police at once, by dialing "911" on your cell phone. If you DON'T, you risk your insurance company denying coverage, and in the worst cases you can be at risk for prosecution if you do not report a collision. The "curiosity factor" typically causes other cars to slow down and view an accident scene, from both sides of the road. What does that mean? That your accident scene can fast become the scene of yet another car accident. Even debris from your collision can wind up in the road and pose hazards that can lead to additional crashes. After pulling over to the side of the road, if possible use flares, flashlights or other markers to alert other drivers. Even if you don't feel injured or hurt - make sure to accept medical treatment that is offered. Far too frequently, accident victims discover "down the road" or later on, that their injuries, which they thought were minor, prove to be otherwise. As time goes by, many times, accident injuries get much worse, especially if treatment was not sought quickly. This is because many of the injuries that result from car accidents are called "soft tissue injuries," and they can worsen over time. 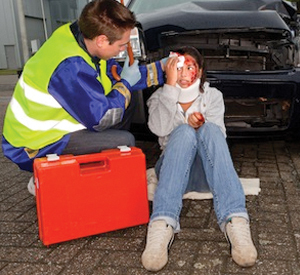 Make sure to also report all injuries to the law enforcement officials who respond to your accident scene. Whatever you do, as Massachusetts car accident attorneys, we strongly recommend that you refrain from admitting any guilt in connection with your collision. When you are asked by a police officer or state trooper to provide information, make sure to cooperate. However, do not talk to the other drivers or passengers involved in the crash, except to exchange contact information. You also have the right to ask law enforcement officers to document any evidence at the scene of the accident. In addition, control your temper. This is NOT the time to swear or harass the other driver and passenger. By doing so, you will be prepared with as much evidence and documentation as possible, without later forgetting this critical information when it will be needed by your attorney. You should call your immediate family as soon as possible to let them know what has happened to you, and to inform them of your whereabouts. If possible, have a family member help you out by contacting our legal offices on your behalf, at (781) 320-0062 and (617) 285-3600. This will give you a "head start" in preserving your legal rights. After an accident, you will most likely be contacted by insurance companies, law enforcement officers, attorneys and others. Make sure to document any such contact, and write down who contacted you, their employer, their job title and why they have contacted you. Include dates and times of contacts and summarize these conversations. Save all written communications as well. Above all, seek legal advice from the Boston, Massachusetts law firm of William D. Kickham & Associates before you speak to insurance companies or lawyers representing other parties to the accident. We can be reached 24/7 by calling us at Ph. : (781) 320-0062 or Ph. : 617-285-3600, or email us confidentially, and we will respond rapidly. As soon as you can, call your insurance carrier at once - but only to report that the accident occurred. Do not answer any other questions about the accident other than the date, time, and location of the accident. Assuming that you wish to pursue a claim for personal injury damages, advise your insurance company that you will be contacting an attorney, and that you will advise them of the name and contact information for that law firm soon. This is important to do, because should you neglect to tell your insurance company that you have been involved in a car accident, they may refuse to pay any insurance claims that you make. Many insurance companies make notification a requirement of your coverage. You will be asked to provide your insurance carrier with a statement about the circumstances of the crash and about any injuries you suffered. However, under no circumstances should you ever provide your insurance company with any other information other than the date, time and location of the accident. Nor should you speak with other persons involved in the accident or their insurance company or their attorneys, without first obtaining legal advice from qualified auto accident attorneys such as The Law Offices of William D. Kickham & Associates. It is very easy for the inexperienced person to "say the wrong thing," and as a result prejudice their legal position. At the Law Offices of William D. Kickham & Associates, we offer FREE CONSULTATIONS and we will travel to you - even if you're in the hospital - to discuss your accident and your injuries. Remember, you pay NO FEES UNLESS WE WIN YOUR CASE FOR YOU. Call us at Ph. (781) 320-0062 or Ph. : 617-285-3600, or email us. Let us show you what we can do to help you recover the maximum financial amount possible for your car accident injuries. If you recognize Attorney William D. Kickham 's name, it's probably because you've seen him on television or in the news. News reporters often seek out Attorney William Kickham for his legal expertise in the field of Massachusetts injury law. Some of these news organizations include Court TV (now In Session on HLN ,) Fox News TV-25/Boston, The Boston Herald, WBZ-AM Radio 1030, WCVB-TV5/Boston, Nightside With Dan Rea, Greater Boston With Emily Rooney, Money Matters Radio/Boston, and The Metro Newspaper/ Boston.